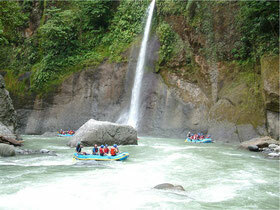 Adventure vacations Trip in Costa Rica, 9 days 8 nights. Costa Rica is a beautiful and privileged country, it is land of Volcanoes, Mountains, beautiful and exotic beaches both on its Caribbean coast and in the Pacific, magical waterfalls and rivers of crystal clear waters. Adventurers who choose Costa Rica as a destination for their next vacation have the opportunity to choose from a variety of activities full of excitement such as world class Rafting, enjoy the forests from the heights through zip lines, waterfall descent, walk inside of caves in natural state, to practice diving, surfing or sport fishing, to travel in mountain bike remote trails and much more. With the Adventure Vacation Package in Costa Rica we offer you the best options to spend a few days full of emotion and adrenaline. This package of vacations we can adjust it to your needs, let us know if you have any preference for another activity to add or extend or decrease visit days. Costa Rica Adventure Vacations: The Adventure people will enjoy a variety of activities such as world class White water rafting, zip lining, Canyoneering, caves. Costa Rica a unique destination for your vacation, natural beauty and adventure. Day 1: Arrival at the airport and transfer to your hotel in San José. Our driver will be waiting for you upon arrival at the Juan Santa Maria International Airport in Alajuela, according to the information you provide on the arrival of your flight, to transfer you directly to your hotel in San José. Depending on your arrival time, you can make a short tour of some emblematic sites of the capital of Costa Rica. Day 2: Pacuare River Rafting and transfer to La Fortuna Arenal Volcano. Your first adventure starts very early when around 6:00 a.m. We go to your hotel to go down the Pacuare River Rafting, scenically impressive, 4 hours of great excitement. At the end we will undertake the trip to one of the favorite destinations of tourists, La Fortuna - Arenal Volcano. 6:00 pm. Registration at the Hotel. This day you will enjoy of multiply activities full of emotion and adrenaline that includes: Zip lines, Canyoning, Climbing, Tarzan Swing, hanging bridges and a lot of challenging activities in the heart of the forest overcoming various obstacles along the way that will provide a unique and unforgettable experience. At the end of the adventure, relaxation awaits you in one of the Hot Springs that emanate directly from de Arenal Volcano. Travel 4x4 trails in your ATV, going up and down in terrain without asphalt, crossing rivers, enjoying green landscapes and moments of great emotion. Very early after a full breakfast we move to Rio Celeste where we will combine the adventure of a bicycle tour with the magical color of its turquoise waters. Transfer to the Monteverde area, considered the most recognized cloud forest in the world, for its great biodiversity, its contribution to conservation and scientific research. Day 6: Monteverde Canopy Extreme. A day to live the adventure in the middle of nature enjoying spectacular views of the Cloud Forest. In the morning you will travel through the treetops in the activity known as Canopy or Zip lines moving through cables including one kilometer long and about 180 meters high, you will also have the opportunity to rock on the cable known as Tarzan Swing. Day 7: Transfer to Manuel Antonio. In the morning hours and after a delicious breakfast, we start the trip from approximately from your Hotel in Santa Elena - Monteverde to one of the favorite areas of visitors, the Manuel Antonio National Park. After registering at your hotel, start the time of relaxation and rest in this vacation in Costa Rica. Day 8: Rest in Manuel Antonio. Relax time, with the option of walking the trails of the Manuel Antonio National Park on your own. Enjoy its paradisiacal beaches. Day 9 Pura Vida Costa Rica! Until next time. Transfer to the international airport for your trip back home. This is coordinated according to the information you provide about your flight. All the transportation to move to the different touristic places included in this itinerary. Tickets to all the National Parks included in this itinerary. 4 Lunches , the days 2-3-4-5. 2 dinners, the days 3-4. Both day 1 and day 2, can be modified according to their arrival and departure flights. Contact us for the modifications that you consider necessary. Rates expressed in US dollars. Fill out the following form if you want to reserve or require more information about the Costa Rica Adventure Vacation Package. Costa Rica is a land of volcanoes, mountain, the most beautiful beaches, cloud forest, rain forests, waterfalls, and rivers. The Adventure travelers can choose from a variety of activities such as world class White water rafting, zip lining, Canyoneering, caves, snorkeling, kayaking, sport fishing, surfing, mountain bike and lots more. The most challenging activity will be choosing what to do! With the Costa Rica Adventure Package we offer you the best option to have a wonderful time.